“Marna has always served as a role model in our firm and we are delighted that others share our view. The dedication of a conference room bearing her name will serve as a wonderful reminder to future generations of lawyers wandering the halls of the DC Bar that purpose-driven careers and commitment to community are worthwhile endeavors. We’re proud that her legacy is one of gracious determination and success,” commented Managing Partner, Jonathan M. Dana. Ms. Tucker is widely known as a preeminent expert in complex divorces, domestic violence, and prenuptial matters, her reputation earning her the nickname the “Diva of Divorce.” She is a Fellow of the prestigious American College of Trial Lawyers and the American Academy of Matrimonial Lawyers and has been repeatedly recognized as one of the “Top Divorce Lawyers” by the Washingtonian and Town and Country, among other publications. 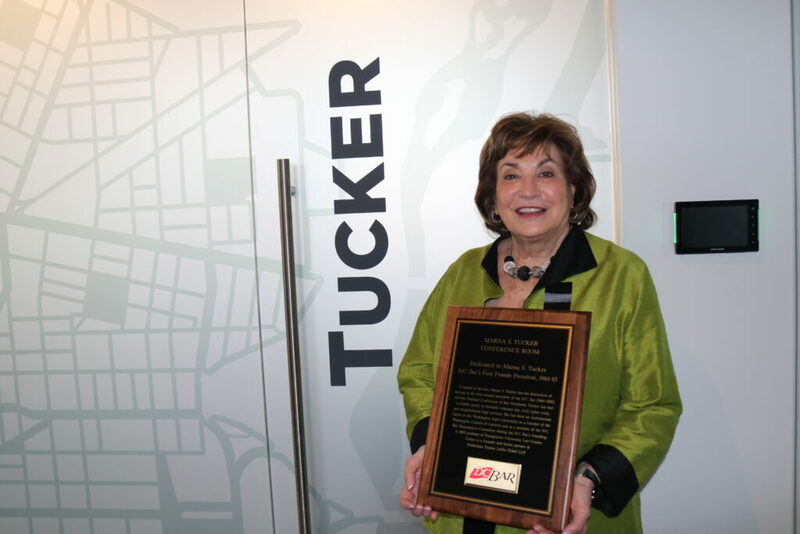 Ms. Tucker has received countless awards and accolades through the years, including: Woman Lawyer of the Year from the Women’s Bar Association of the District of Columbia, the honoree of the National Women’s Law Center, and an Alumni Achievement Award from the Georgetown University Law Center. She was one of only 5 women receiving her LL.B. from Georgetown University Law Center in 1965. Feldesman Tucker Leifer Fidell LLP (FTLF) is a law firm deeply committed to helping individuals and organizations successfully advance their vision. The firm’s attorneys are recognized by clients and the legal community for their dedication, integrity, and expertise in Family Law, Federal Grants, and Health Law. The firm was founded in 1970 and has offices in Washington, D.C., Bethesda, Maryland, and Arlington, Virginia.